Skinny houses don't always have to be uncomfortably cramped spaces, as these architectural examples demonstrate. Architects have managed to work wonders with designs that are no more than a few feet wide. As long as you aren't extremely claustrophobic, these houses could be handy budget-friendly accommodation solutions. According to Trendhunter by opening up the interior space and ensuring the rooms within the house aren't blocked off from each other, designers can turn a small space into an extremely comfortable abode. From slender angled architecture to tall skyscrapers, these examples of skinny houses are perfect to demonstrate the unlimited possibilities for what to do with a tiny amount of space. O House designed by Japanese architect Hideyuki Nakayama was designed around a super slim floor plan. The house features two storeys with wrapping spiral staircases and features an enchanting garden and two lengthy stacked corridors. Elements such as kitchen, a dining table, furniture and a bath tub are set around the main house, encircling the main house. The space is somewhat like a passage garden by alternately aligning the exterior and the lean-to along with the site boundary. The place where the family sleeps is on second floor of the main house and one will access from the staircase reaching out from the passage garden. The project was completed in 2009. SIP Panel HouseThe SIP Panel House brings slender, modular and modern together in a piece of architectural beauty not seen elsewhere. The house was erected in just 10 short days with little to no construction waste. Using two types of panels, the architectural project is comprised of 71 wall panels and 40 split-level panels. SIP was designed by architects Alejandro Soffia and Gabriel Rudolphy, the SIP Panel House can be found in Santo Domingo, Chile. Like a horizontal deck, wooden panels cover the side of the SIP Panel House while the front is all black, adding a nice contrasting detail. The key feature of this home, however, are the floor-to-ceiling windows facing the ocean. The Mount Fuji Architects Studio Near House is an ultra slim house designed to squeeze into a small piece of land in the over-crowded area of Tokyo. The house includes two floors, wooden shelves and ladder stairs. The site is 66.42 square metres with the house taking up only 37.65 square metres of this space. The width of the Near House is about 1/4 than that of a standard Tokyo home, making for an extremely petite living space. The building is essentially two houses in one with the main house featuring a bathroom and bedroom on the ground floor with the kitchen and living space on the first. The property was completed in 2010. The property designed by Nils Holger is incredibly space conscious. His Walden home is only 91 centimetres wide and two storeys tall. Walden was inspired by the nature-loving author Henry David Thoreau. This house is small and mobile, which makes it perfect for nature lovers like Thoreau. With the Walden House, you too can enjoy all of the comforts of home in the middle of nature. 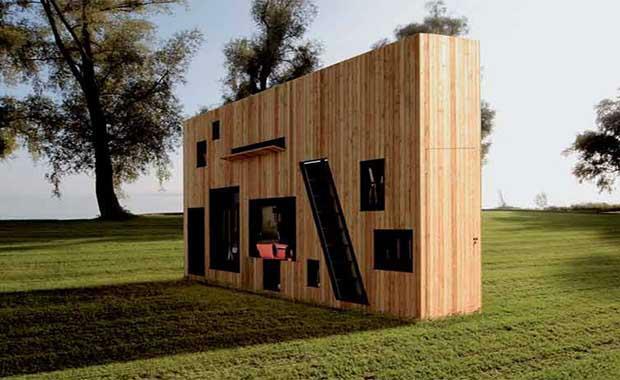 Constructed from lightweight wood and meant to serve a variety of purposes beyond just simple garden shed— Walden makes the most of a limited amount of space with a bunch of nifty exterior compartments for stashing outdoor/gardening gear, a living/dining area that can squeeze in four people, and even a sleeping loft with a skylight that’s accessed via a hidden staircase. The design was completed in 2006. The Ferrolan LAB Family houseThe Ferrolan LAB Family house was designed to fit the landscape. The house spans are mere 3.6 metres in width. The house however manages to pack a lot into its 371 square metre space. Located in beautiful Barcelona, Spain, the Ferrolan LAB Family House features an open concept design so it appears a lot roomier than it is. Aside from its unique shape, the Ferrolan LAB Family House boasts hand-controlled slats and great indoor sculptural details such as a curving wooden stairwell. It was completed by Ferrolan LAB in 2010.